Paddle with Sea Monsters! Actually these up to 12 foot long one ton air breathing mammals are the gentlest of the giants of the underwater world! Join us for a passive observation paddle that often results in OMG moments of delight and amazement! 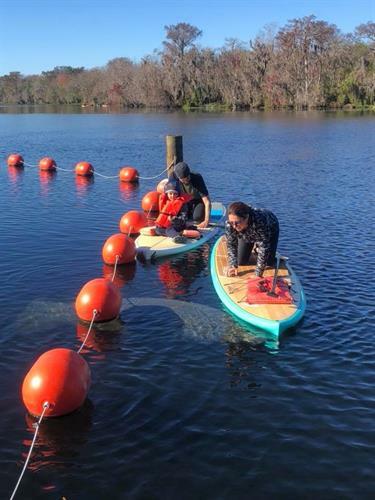 Suitable for beginners, although the cold weather that brings the manatees to the springs can be less than ideal to paddle in, it's so worth it to see these puppy like creatures up close and personal. Being that they are a protected/endagered species we'll take extra time in the beginning to make sure everyone knows the rules and laws surrounding manatees. After a quick paddle tutorial; We’ll put in at the French Landing boat ramp and paddle towards blue springs. Along the way we'll hope to see some sea cows out grazing in the st johns river as they are apt to do. If its really cold, we'll hug up next to the roped off area and watch for manatees to come and go. If the conditions are less than desirable on the water, we'll beach our boards at the state park and go ashore to observe these creatures from the boardwalk. Meet at French Landing Boat Ramp, Orange city fl. Make sure you continue past the front entrance to Blue Springs and follow the dirt road to the end. Included: high quality properly sized paddle and paddleboard. Based on your height and weight we will provide a board that is best suited for you. Per coast guard requirement a type 3 pfd is also included, this must be on the board but can also be worn if preferred. Additionally, for safety and guidance, SUP instructors will accompany the group along the way. No paddlers are left behind, all particpants are required to stay with the group. Got Your Own Board ? Just show up on the day of the paddle!! We'll update our FB event page in the event we need to cancel. Want to join our group with your board ? Please do!! There is no charge from us to join our group! There are 3 things you'll need to do! 1) arrive early so you can find parking and unload your board and gear. 2) You should be familar and well aquainted with your board and paddle, don't make this your first trip with your new board. A 2 hour trip on gear that has never been used, is not a good idea. Make sure you have some basic sup experience with your board and paddle before joining this kind of paddle. A great warm up paddle are the Saturday morning beginner lessons at dinky dock. Those are free with your own board as well. Make sure you continue past the front entrance to Blue Springs and follow the dirt road to the end.